Standing in line at the grocery store this weekend, I picked up a spirituality and health magazine I hadn't seen before. The material was meaty, but presented in a lifestyle-y sort of way, like Martha Stewart or REAL SIMPLE or DWELL. One article included a concise summary of a concept that has fascinated me ever since Mark Barden shared it, years ago - the idea of spiral dynamics. 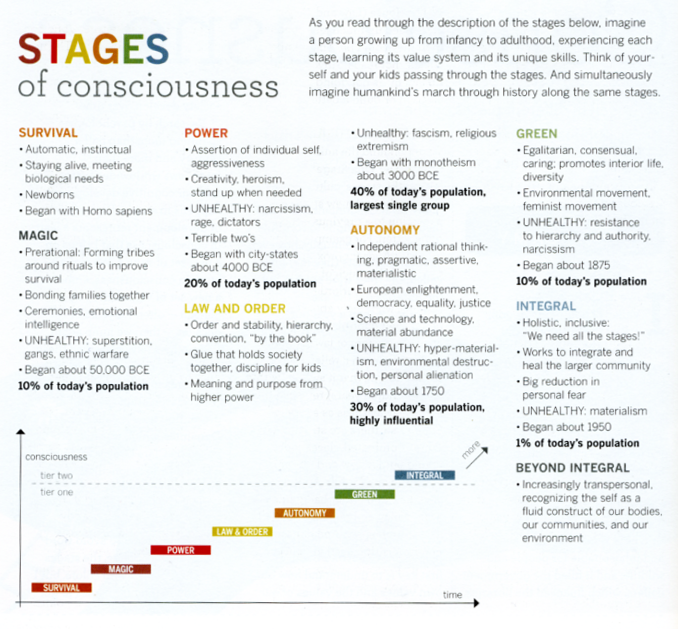 The concept is, life has an upward developmental thrust, and if you laid out all of the models of human development, all of the ways we measure and describe the different levels of consciousness and its growth, all the models would roughly agree and overlap as the stages described here. For me, this dynamics model is thought provoking and helpful in recognizing and understanding patterns happening within me and around me. I'm encouraged these ideas can be found in a supermarket - presented so anyone could be interested and understand - to spark thought and discussion. 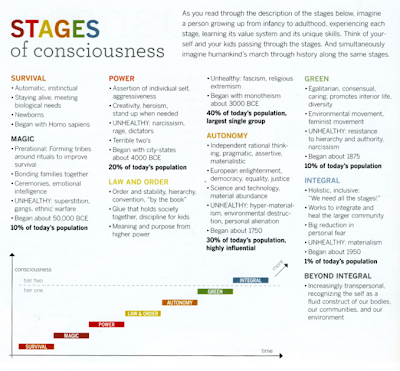 I look at this chart and wonder if it makes sense to talk about the consciousness level of a corporation? How would an Integral company behave? I wonder whether any big brands or companies could be described as Integral? Not sure. Starbucks, maybe? Wikipedia. Apple and Nike, in some respects? Facebook and Google pretend to be at times, but I think they're really more Autonomous? Is the legal structure of the corporation Autonomous itself, and therefore preventative of true Integral behavior? Do all of the systems we depend on need to grow in consciousness? I look forward to further discussion with Mr. Barden.